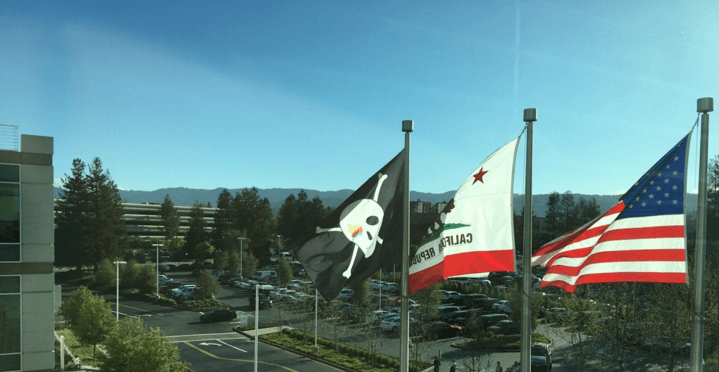 Apple is turning 40 today and as well as celebrating the good times, the company is commemorating a more divided time in its history with the hanging of a Jolly Roger flag at its HQ in Cupertino. He was referring to his team that created the original Mac. In the early 80s, Apple was already a big company and the success of the Lisa computer seemed to be determining its every move. Never one to go with the crowd, Jobs had a small team working in a separate building on the first Mac and the flag was used to signify their rebellious nature as they continued to work independently of the rest of Apple’s teams. The legend goes that the team working on the first Macintosh made the flag out of some old material, paint and an Apple logo decal they found in the office. They then hoisted it over the Mac team building using a makeshift flagpole without prior permission from Jobs. Luckily, he liked the flag and it remained a permanent fixture until the Lisa team took it down and held it ransom in an act of friendly rivalry. The Mac team managed to steal the flag back and the rest is history. So for some who might see it as Apple just dangling a pirate flag at its office, the Jolly Roger has much deeper roots in Apple’s computer history, signifying a time when Steve Jobs was leading true innovation despite the higher-ups being decidedly against him. The flag flew at the campus for over a year before disappearing without explanation in the late 1980s and to this day, it hasn’t been displayed again. It’s symbolic to see Apple celebrate its 40th anniversary and Steve Jobs’ innovation by raising it at Infinite Loop today. Read next: Are unicorns on the verge of extinction?